Over the years our tool store has had the honor of being visited by a great many fine woodworkers and builders. They have helped us build our inventory and learn about tools. Once each month we'll feature one of our favorite customers, some of their best work, and some of their favorite finds in our tool store. Neil Knecht, of Monroe Connecticut, was in a few weeks ago during one of his annual trips to Maine. As a fourth-generation woodworker, he creates custom furniture, built-ins, cabinets and architectural details for both residential and commercial clients. 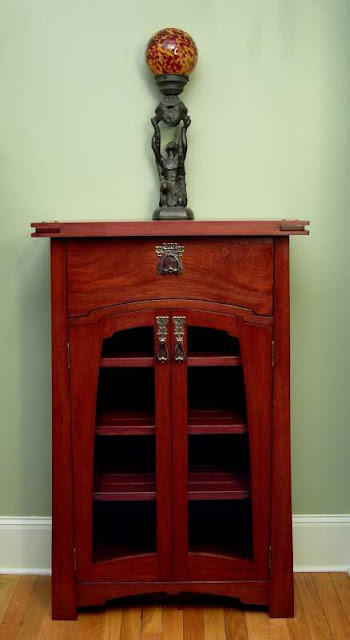 Featured here is a Greene-and-Greene- inspired mahogany media cabinet. He was sure to let us know that he makes a point of stopping by Shelter Tools (formerly Woodbutcher Tools) to pick up a few hard to find pieces. During his visit he picked up a number of hand tools including skew chisels, a flush cutting saw, and a hammer. But his favorite item . . . the one he really sought out is the Japanese Nail Set—a hard to find tool that is indespensible in the workshop and on site when doing any kind of fine woodworking. Check back with us next month to see another real woodworker and to see their favorite tools.